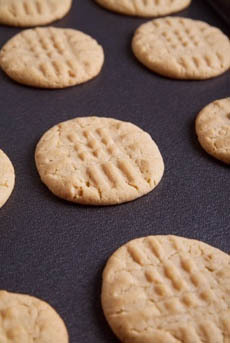 The peanut butter cookie gets its surface texture by flattening with the tines of a fork. Photo by Curt Pickens | IST. If it weren’t for the great scientist George Washington Carver (1864-1943), who developed hundreds of uses for the peanut, we might not have peanut butter cookies. Among his hundreds of uses were “105 Ways of Preparing [Peanuts] for Human Consumption.” This document includes three recipes for peanut cookies, using crushed or chopped peanuts as an ingredient. But it took a while longer for peanut cookies to turn into peanut butter cookies. This recipe contains flour. For a flourless cookie that can accommodate those with gluten sensitivity, see this delicious recipe for Peanut Butter Chocolate Chunk Cookies from San Francisco chocolatier Michael Recchiuti. For a superior flavor, use organic peanut butter (or an artisan brand) and top-quality peanuts. 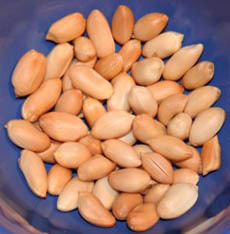 Whole peanuts are chopped and added for flavor and texture. Photo by Krzysztof Kutzmann | SXC. Preheat oven to 375°F. Lightly butter two large cookie sheets (12 x 18 inches); alternatively, line cookie sheets with parchment paper. In the bowl of a standing electric mixer fitted with the paddle attachment, mix the oil, peanut butter and brown sugar on medium speed for two minutes or until well blended. Add the egg and vanilla, increase the speed and beat for another two minutes or so until the mixture becomes smooth and creamy. Set aside. Sift together the flour, powdered sugar, salt and baking soda; break up any lumps. Add this dry mix and the chopped peanuts all at once to the mixer and incorporate on slow speed for 20 seconds. Finish blending the dough by hand with a large rubber spatula, ensuring that the nuts are well distributed. Bake the cookies one sheet at a time for 20 to 22 minutes, until they are a deep golden brown. If you want to bake two trays at once, rotate the trays back-to-front and bottom-to-top halfway through the baking time, and bake longer if necessary. Let the cookies cool on the sheet until crisp. Store in an airtight container. Lifestyle Direct, Inc. All rights reserved. All images are the copyright of their respective owners.